I hope you will permit me just one more Noche de Rabanos (Night of the Radishes) post. 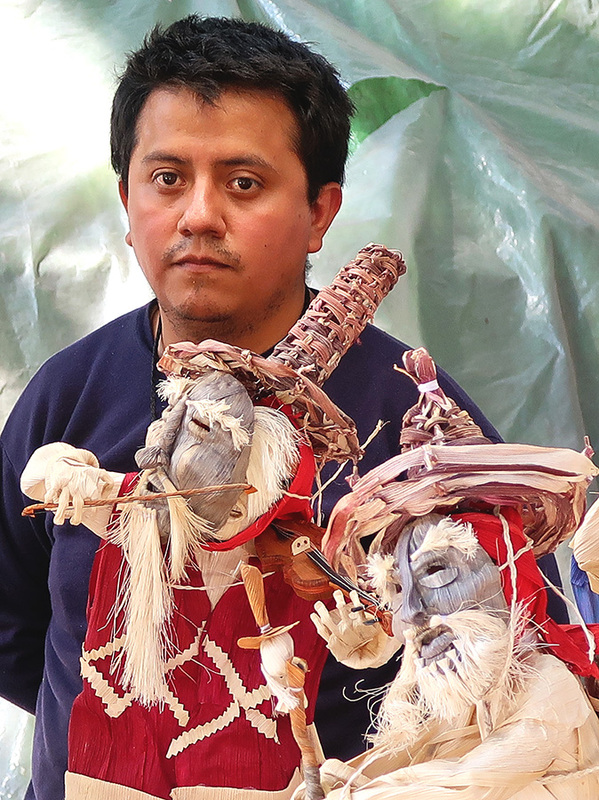 The Totomoxtle Decorado category wouldn’t be complete without showing this year’s entry, “Los huehuentones de Huautla de Jiménez” by Moisés Ruíz Sosa, last year’s first prize winner, who just happens to be the brother of this year’s winner, Marco Antonio Ruíz Sosa. 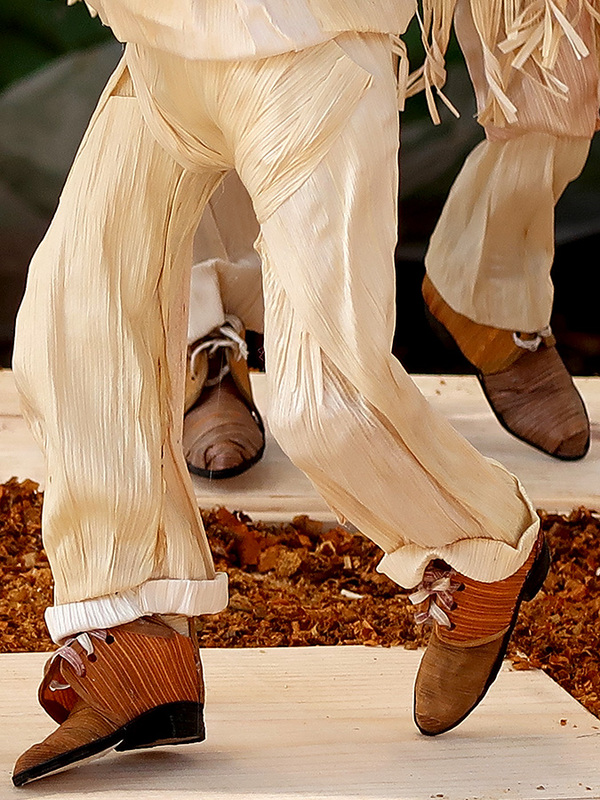 Much of the work by Moisés, at least that I have seen, uses natural and dyed corn husks to recreate traditional dance scenes. 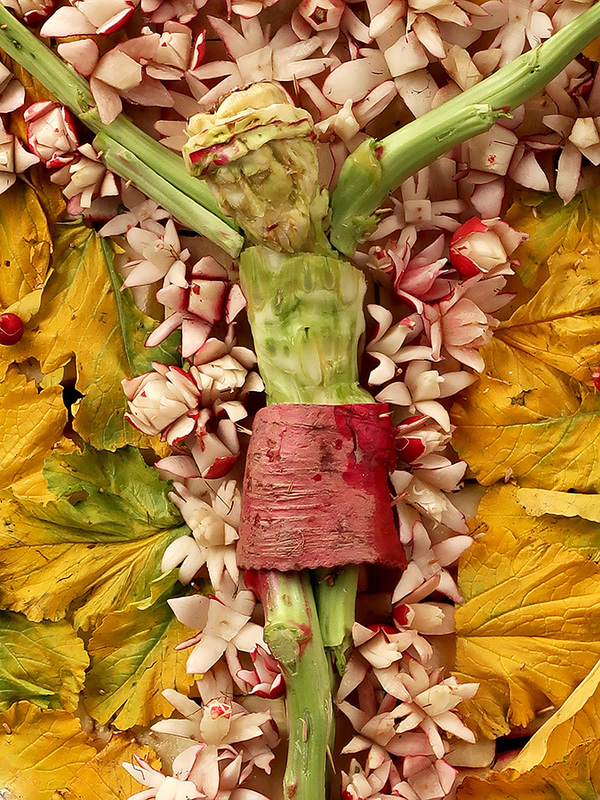 This year’s inspiration came from the Mazateco Day of the Dead celebrations. 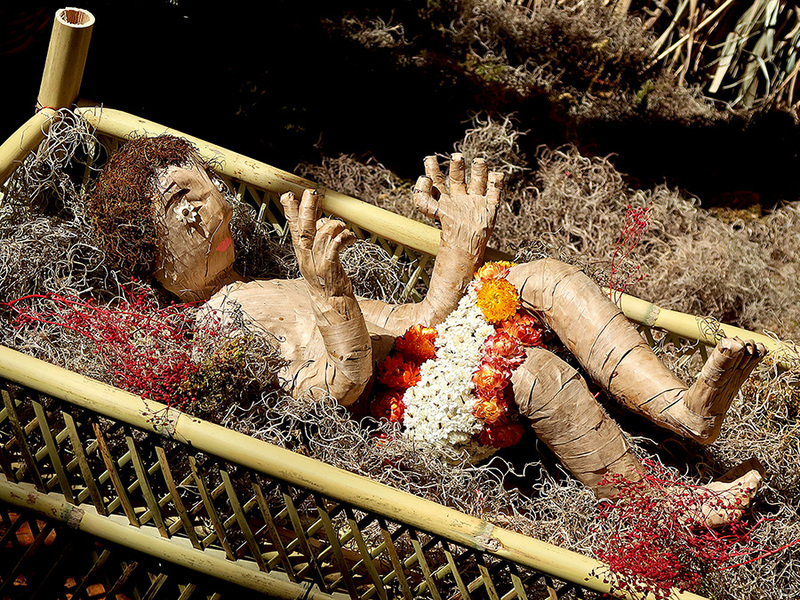 After the souls are released, their spirits are transformed into different forms personified by the Huehuentones (people of the navel — born from the center of the earth) who serve as a link between the departed and the living. 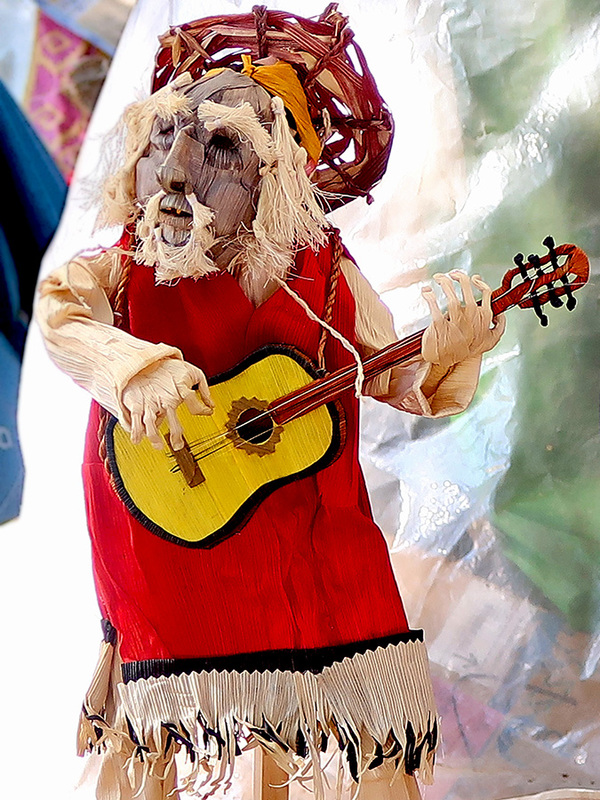 Beginning October 27, they roam the streets and visit families, house by house, to play and sing Mazatec themes of family, famine, traditions, customs, current events, politics, etc. 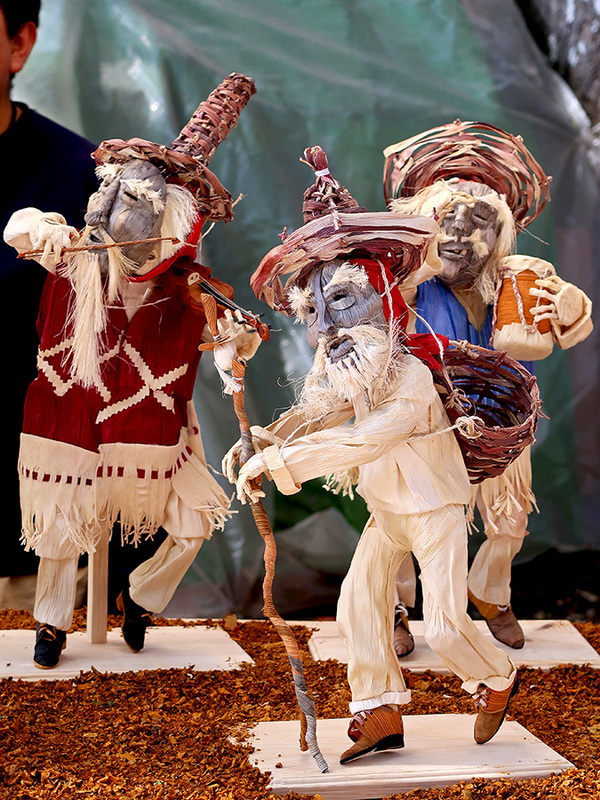 What captivates me most is the attention to detail and reverence for traditions by Moisés. Learning their craft from their mother, Moisés and Marco are a couple of very talented brothers! 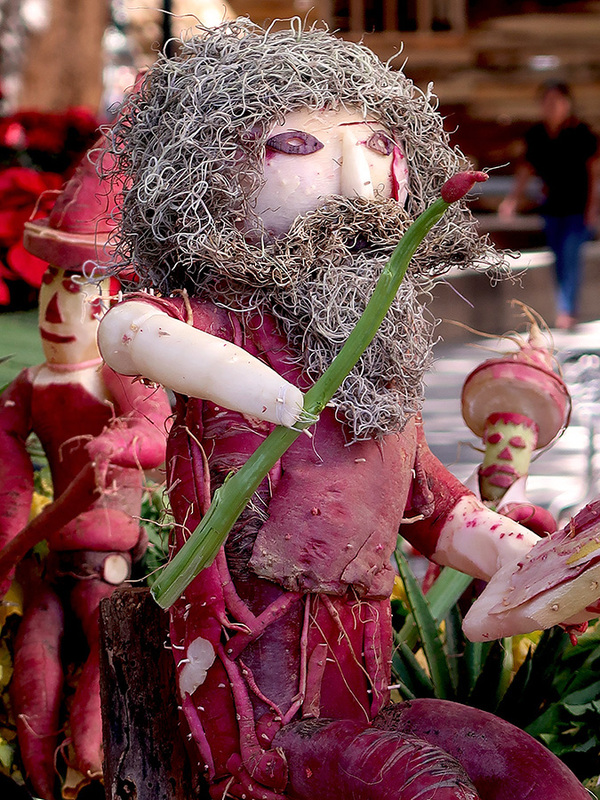 I think I spied some familiar figures in the radishes at this year’s Noche de Rabanos. Could this be carver, Zeny Fuentes? Oaxaqueños can tell you, this is their own, Señor del Rayo. And then there is this guy. I’m guessing Maestro Francisco Toledo. 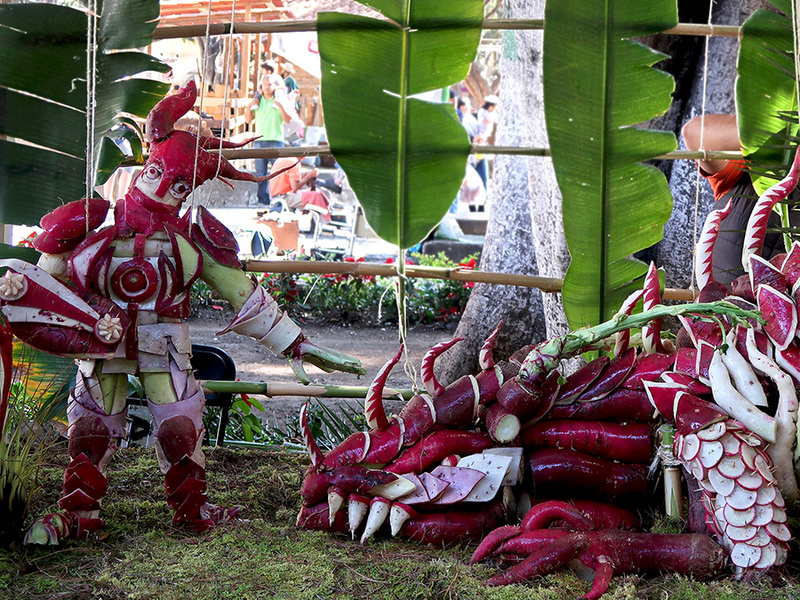 The 120th edition of the “only in Oaxaca” Noche de Rábanos is coming. 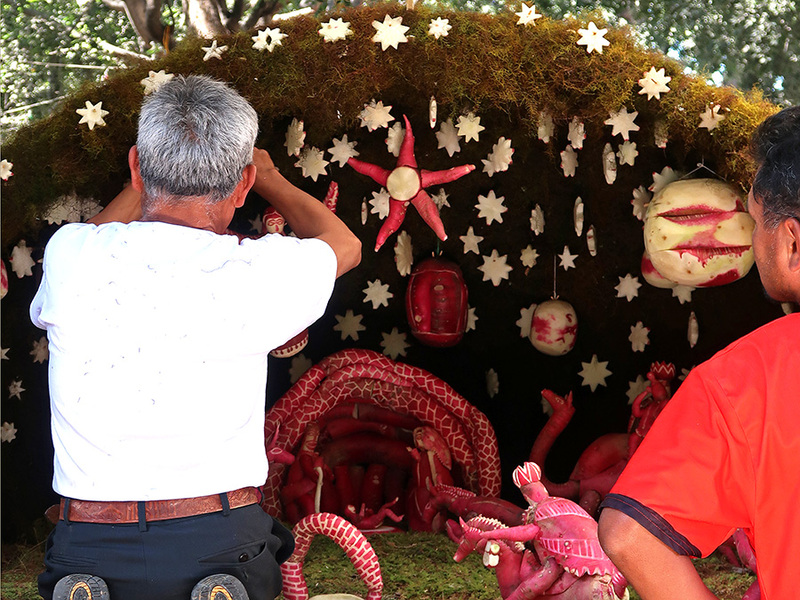 Tomorrow (December 23) the zócalo will be filled with radishes carved into religious, cultural, and fantastical creations. 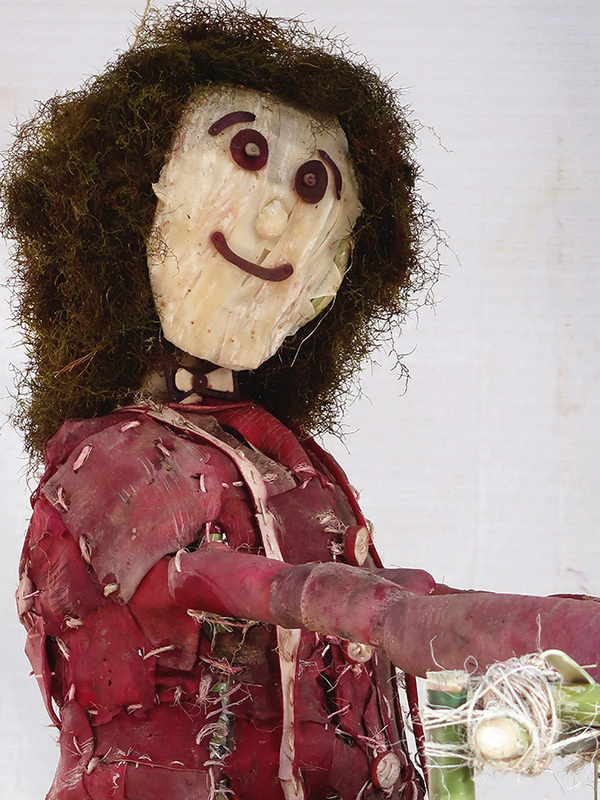 And, it’s not just a night of radishes, there will also be flor inmortal (a type of dried flower) and totomoxtle (corn husk) artisan creations on display and competing for prizes. Not to be missed! Artificial Christmas tree vying for top honors with an Indian laurel on the Alameda. Baby Jesús wearing his flor inmortal diapers in the courtyard between Del Maguey and Los Baúles de Juana Cata. “Star of wonder, star of light” above Amate Books on the Alcalá. And, yes, the sky really was that blue today. 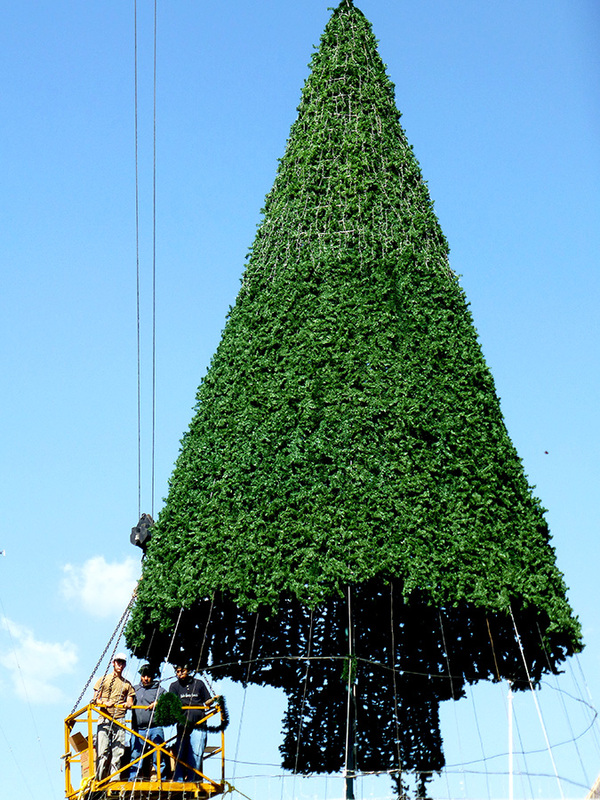 This year, a Christmas tree grows in Oaxaca. Well, not a real, living tree. This one, almost 3-stories tall, was constructed over several days alongside the Cathedral. Adding the green panels to the frame. What can I say? 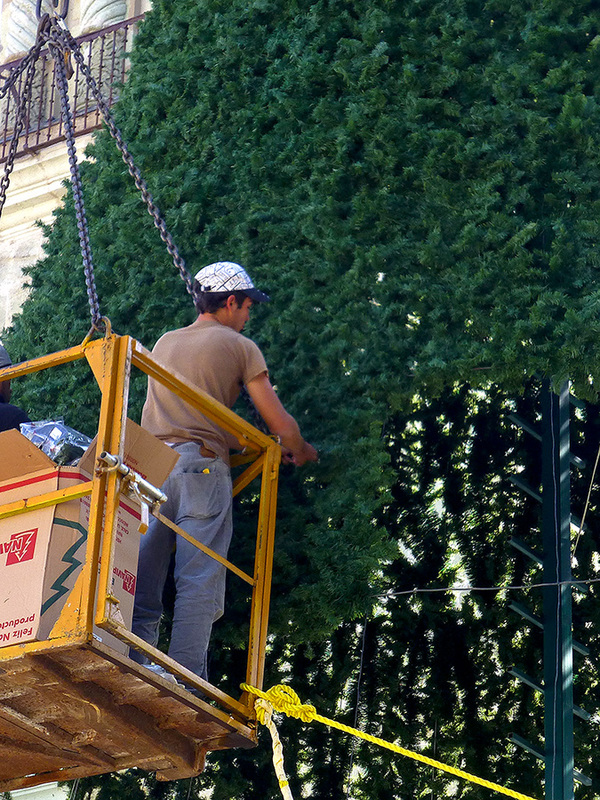 Nacimientos (Nativity scenes) are traditional here; Christmas trees are not. 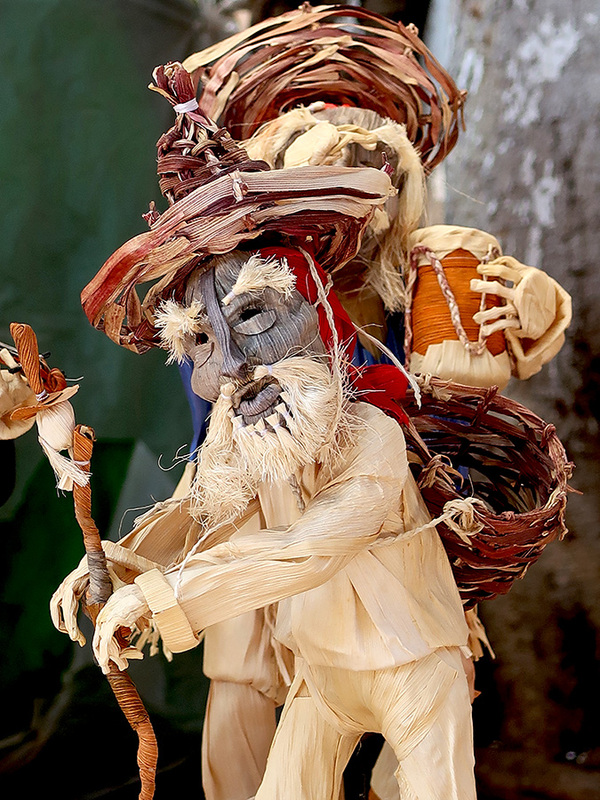 However, despite what we like to think, traditions are not static, they evolve. People come and go across oceans and across borders and they bring back what captures their fancy. All I know is that the city is alive with the sound of music, energy, and lightness of being. 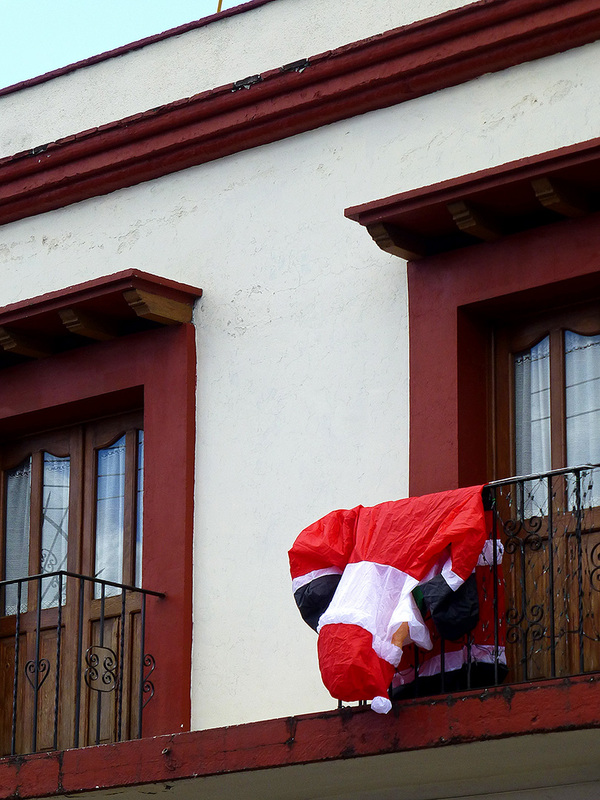 Actually, I took this a few weeks ago on Matamoros (at Tinoco y Palacios) with the intention of writing a blog post lamenting Christmas traditions (Christmas trees, Santa Claus, consumerism, etc.) migrating down from el norte. But, I think I’ll just let the image speak for itself. ‘Tis Christmas Eve in Nueva York and, while we may be dreaming of a white Christmas, there is not a snowflake in sight. However, the stockings are hung by the chimney with care, a plate of Christmas cookies is awaiting a hungry Santa Claus, and tonight I will read Pancho Claus to my grandson. It will be his first time hearing Ernie Villarreal’s version of Pancho Claus by Chicano music legend, Eduardo “Lalo” Guerrero. Hopefully, he will learn a few more words in Spanish and, whether I’m visiting or not, it will become a family tradition. It’s a quiet Nochebuena (Christmas Eve) in my childhood home here in Mill Valley. 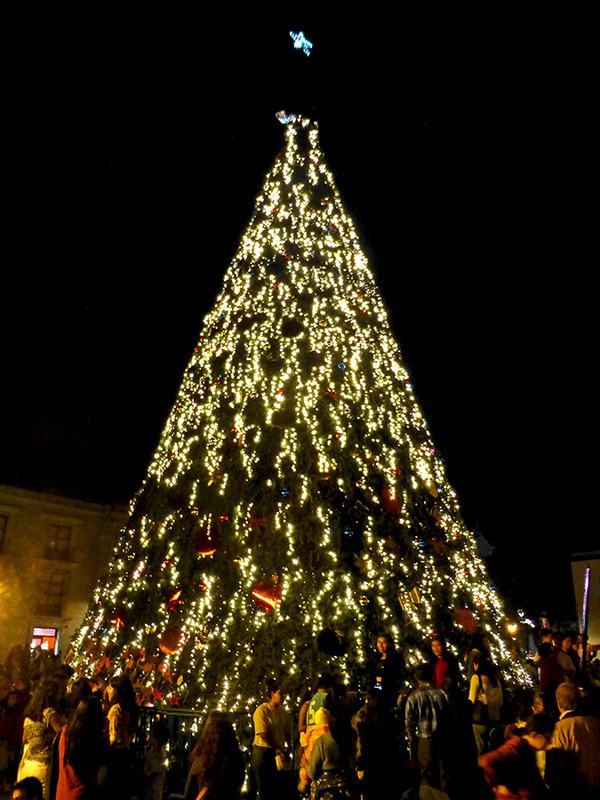 There are no sparklers to wave, no nacimiento stands in the town plaza, and no posadas are likely to knock on the front door tonight. However, there is a fire burning in the fireplace, stockings hang from the mantle, and a Douglas Fir is standing in the living room wearing four generations of family Christmas treasures. And, visions from Ernie Villarreal’s version of Pancho Claus, by Chicano music legend, Eduardo “Lalo” Guerrero, dance in my head. Carlsberg and Stella Artois… What is it about beer and Christmas? 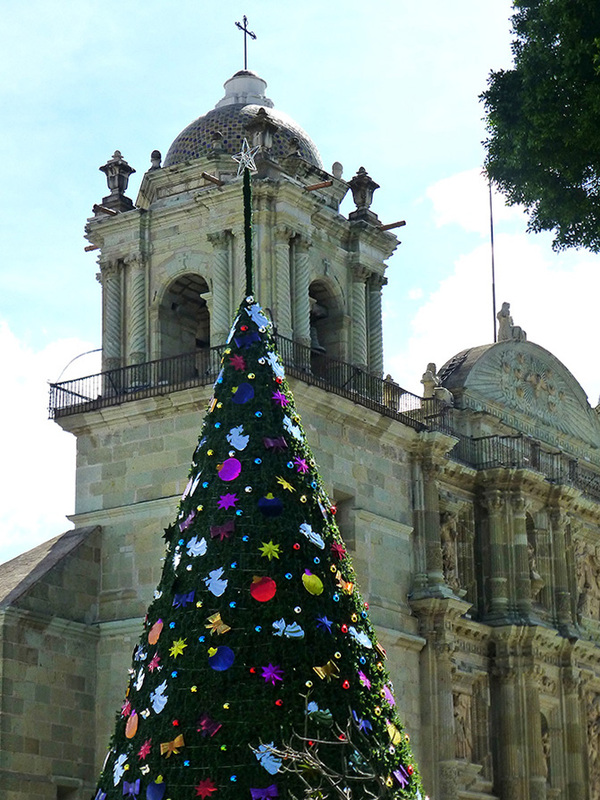 Noche Buena (Christmas Eve) in Oaxaca means posadas from churches around the city converge on the zócalo. 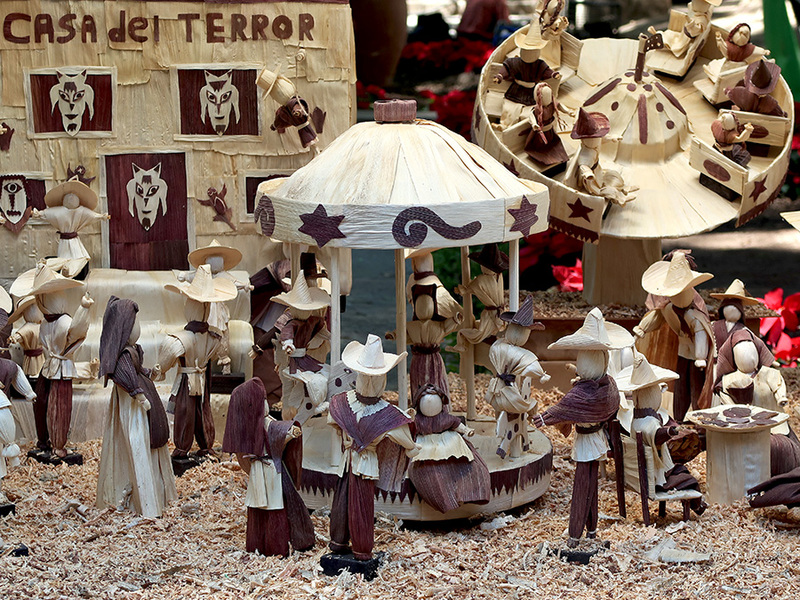 Flatbed trucks carrying Jesus, Mary, and Josephs; fireworks, pinwheels, and sparklers; brass bands; China Oaxaqueña folkloric dancers; and the faithful carrying candles arrive to circle the zócalo again and again and again. Spectators, young and old wave sparklers, take photos, and crack powder or confetti filled eggs on each others heads — and it’s quite a scene! And, in what has become a Christmas Eve tradition (it was still Christmas Eve when I began this post) on my blog, Ernie Villarreal’s version of the song, Pancho Claus, by Chicano music legend, Eduardo “Lalo” Guerrero. Ernie Villarreal’s version of the song, Pancho Claus, by Chicano music legend, Eduardo “Lalo” Guerrero. 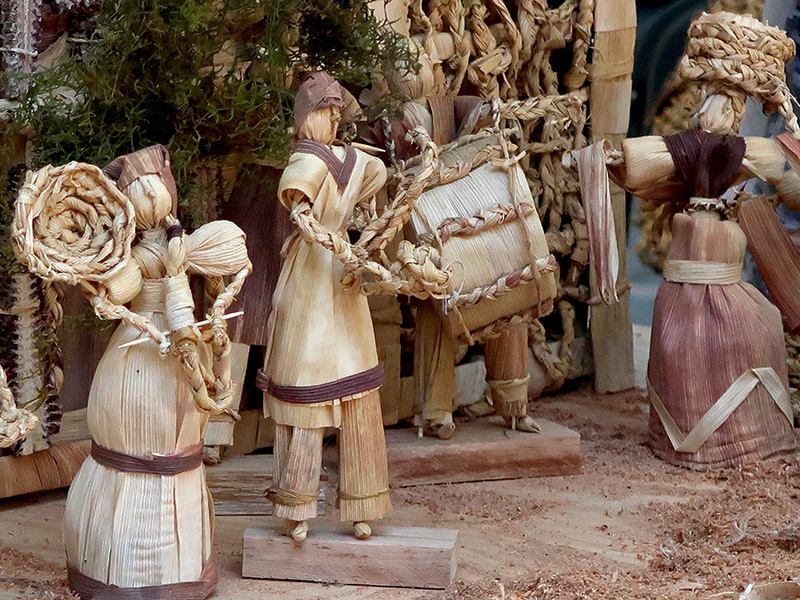 Although Christmas trees are making inroads, in Oaxaca it is the nacimiento de navidad (nativity scene) that is the omnipresent symbol of Christmas. Unique and personal, they are seen everywhere; the zócalo, homes, hotel lobbies, store windows, and every kind of business you can think of! And, yes, this “spiritual but not religious” gringa couldn’t resist a miniature woven straw one of her own. It’s a work of art! For the first time since I began nesting in my cozy little rooftop casita, I’m not heading north for Christmas. I admit to having decidedly mixed feelings; my family and most of my closest friends are up in El Norte and I’m already missing them and the traditions we have created. However, this year I get to share the holidays with new friends, create new traditions, and experience festivities heretofore unimagined — Noche de Rabanos (Night of the Radishes)? I can’t wait! 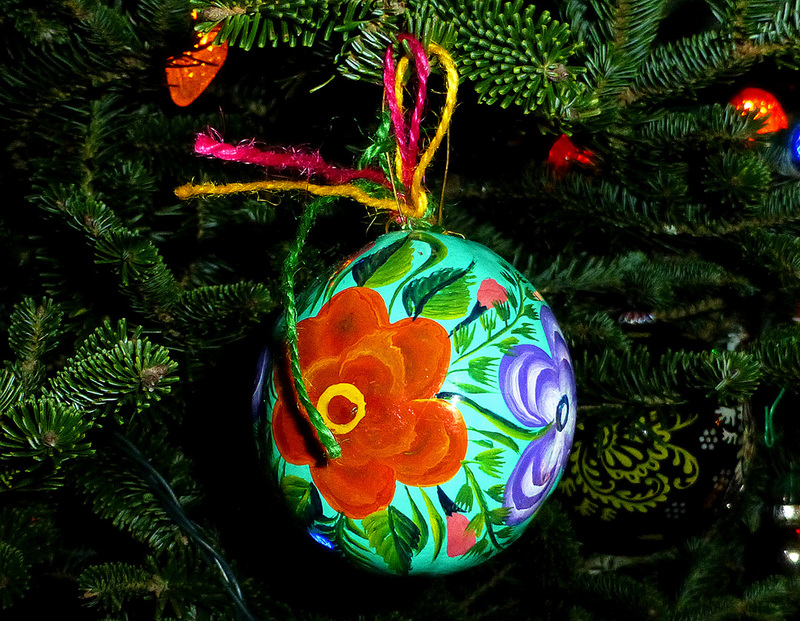 too small to hang my favorite Mexican ornaments on its un-scented, wiry but green(!) boughs. 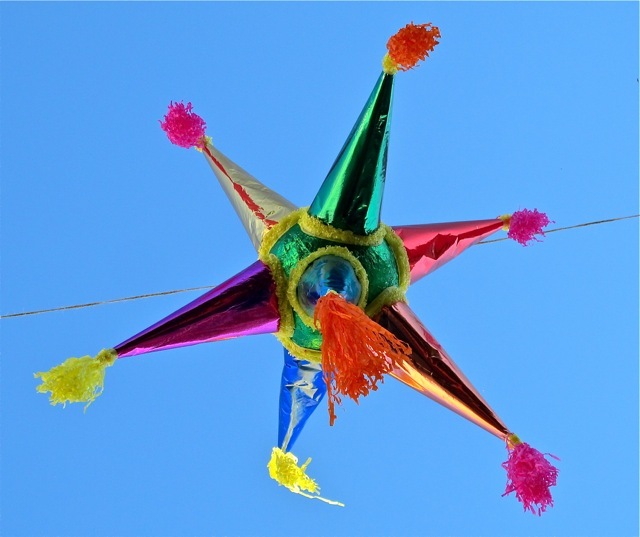 These colorful and wonderfully bouncy decorations will be purchased and a place for them in and around Casita Colibrí will be found. 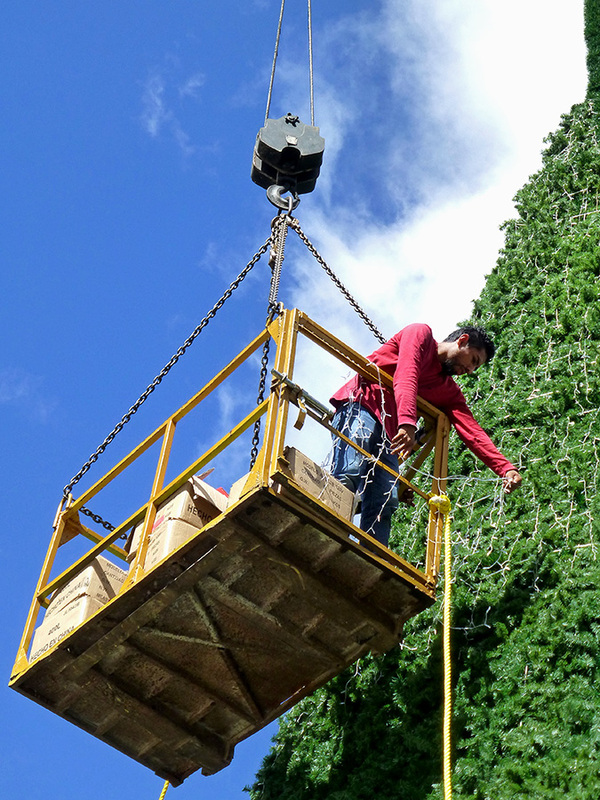 Trimming my tree will present some challenges. 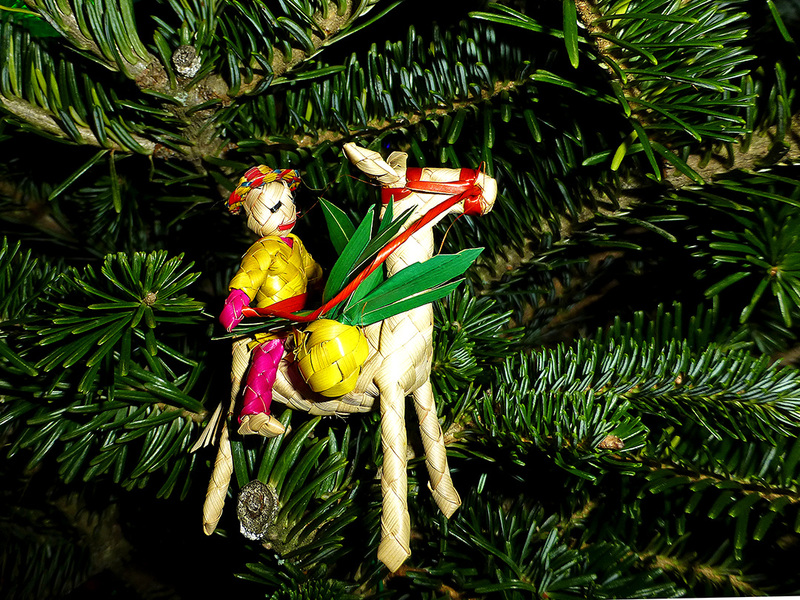 No cartons of ornaments, lovingly collected and stored by four generations of the family, to bring down from the attic. And, as I’ve said, the tree is tiny. I’m thinking… digging into my earring collection might be a good place to start. However, these earrings will have to wait to adorn the tree until after I wear them tomorrow. 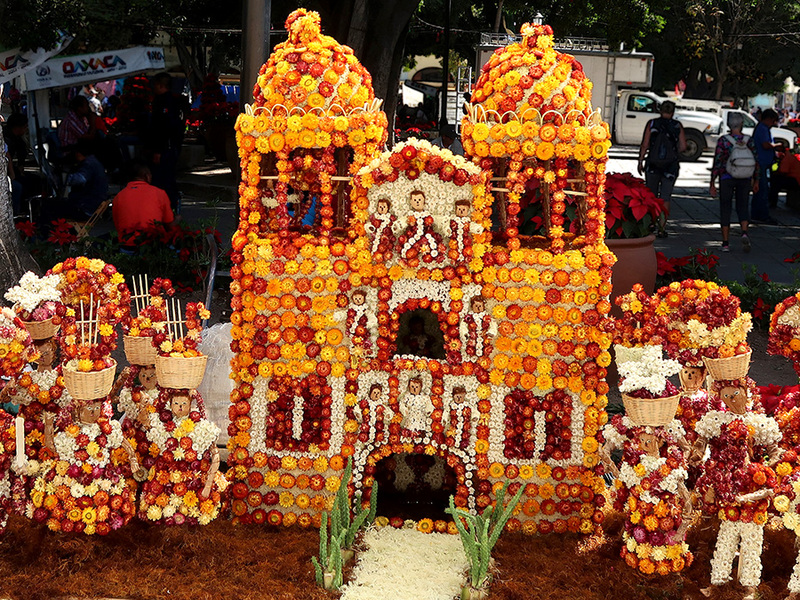 December 8 is the celebration of the Virgen de Juquila — the first of three Vírgenes honored by Oaxaqueños in December. There will be parades. There will be fireworks. There will be wildly clanging church bells. And, there will be an abundance of magic this month, of this I have no doubt! A few weeks ago, my neighbor gave me the following poem based on the Clement C. Moore classic, ‘Twas the Night Before Christmas. The author, she said, was unknown. The reference librarian in me couldn’t resist doing a little digging and found that this is Texas Public Radio DJ Ernie Villarreal’s version of the song, Pancho Claus, by Chicano music legend, Eduardo “Lalo” Guerrero. 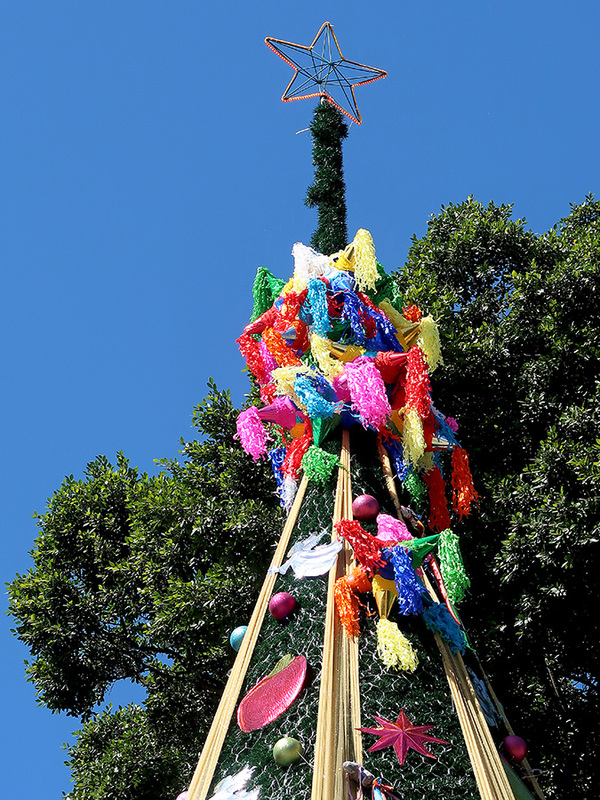 Piñata at the southeast corner of the zócalo in Oaxaca. 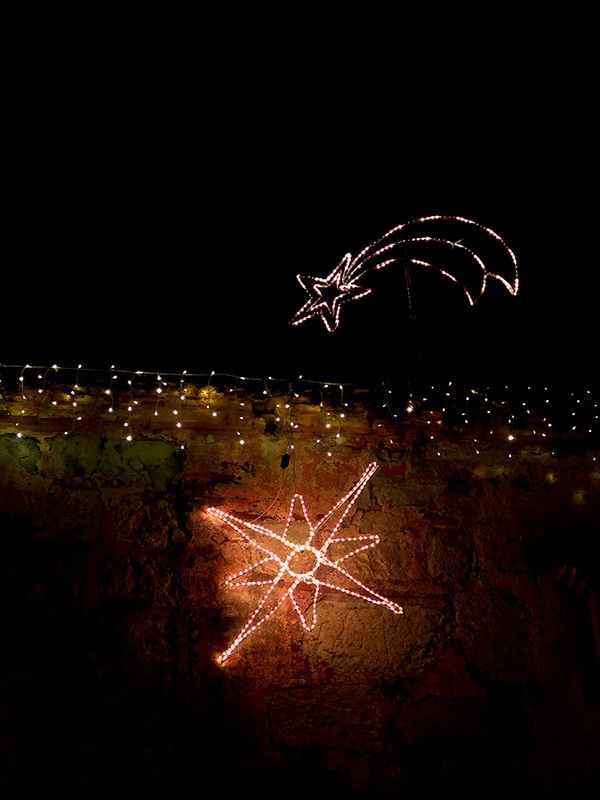 Paz y alegría a todos ~~ Peace and joy to all. And the juxtapositions continue; the annual nativity scene set up on the zócalo in Oaxaca across from the Government Palace and the ongoing occupation by the women of San Juan Copala, not to mention the ubiquitous banners of Section 22 of the Teachers’ Union. Then there were the impossibly cute kids and a rapid request from them. “Mas despacio, por favor,” sez I. A slow motion reply followed, “To-ma nu-es-tra fo-to,” sez the older girl. And, so I did!